As the world eagerly awaits the start of the World Cup, betting sites are alight with special offers on all things football. The latest prize on offer is sure to fan the flames of World Cup fever to astronomical heights. Cloudbet.net opened a competition with a prize of 100 Bitcoins awarded for predicting the perfect World Cup Bracket. 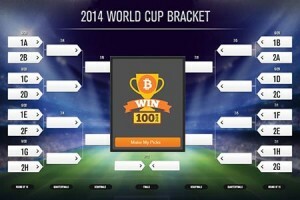 Following in the footsteps of Warren Buffet’s $1 billion prize for anyone who is able to predict the perfect March Madness bracket, Cloudbet.com is now promising 100 Bitcoins to sport aficionados who are able to choose the perfect World Cup Bracket. The going rate for the 100 Bitcoins is around $65,000 which might be a far cry from Buffet’s prize money but is still a very desirable prize. The competition is open to anyone with a Cloudbet account (which is free to open) and entries are accepted until noon GMT on Thursday, 12 June. Competitors from all over the world are welcome; all one needs is a vast amount of good luck.